Monty’s Hill Chardonnay 2008 – This wine was one of the 3 choices from their menu. I will not comment the wine as I could not drink more than a sip. Better don’t order it. This was preferred by most of the girls at the table. I am not a fan of Rose’s but the wine has nice aromatics of red fruits and floral flavors. What troubles me is the high alcohol level for a wine that is supposed to be consumed on a hot summer day: 14.4% alc. So based on the reaction of friends from the table this will become a blockbuster rose this summer. If you hear about a cooking event with Adi, don’t think twice before booking a seat as you will not be disappointed by the food and you’ll probably end up like me: wanting to taste again and again his food. 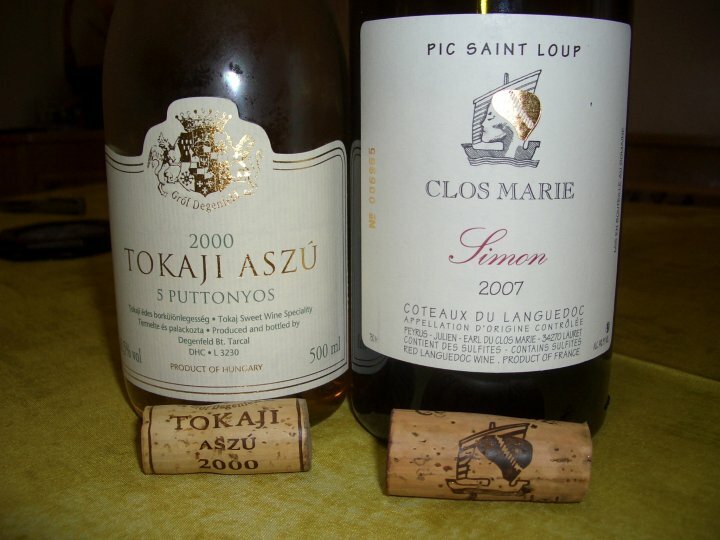 I had these two wines on SAT together with some tasty home cooked French food and very nice company. 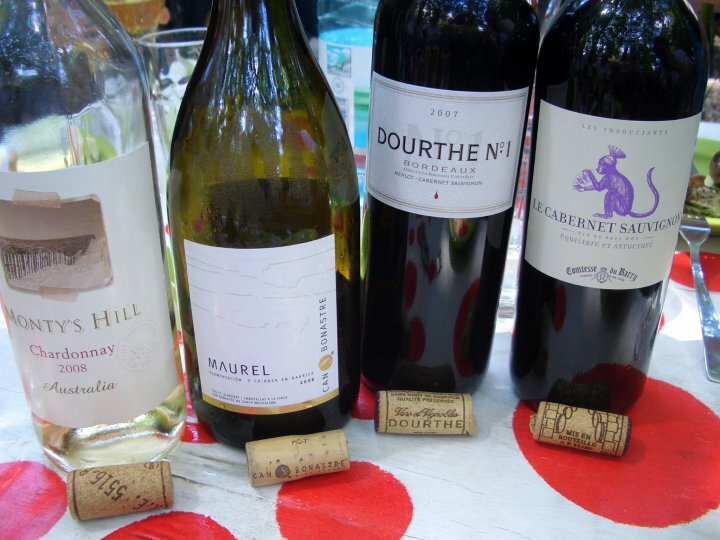 I hope our guest, Alecsandra, had a good time and enjoyed the wines and the food as much as I did. 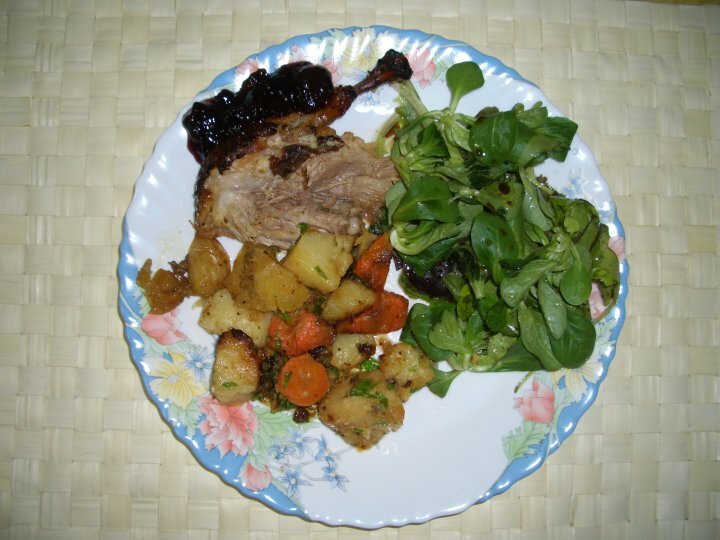 The menu,with one small exception, was home cooked with ingredients brought from my recent trip to France: duck prepared in two different ways. We started initially with some old fashioned foie-gras and confiture d’oignons paired with a 10 years old Tokaj Aszu 5 Puttonyos: a marvelous combination. 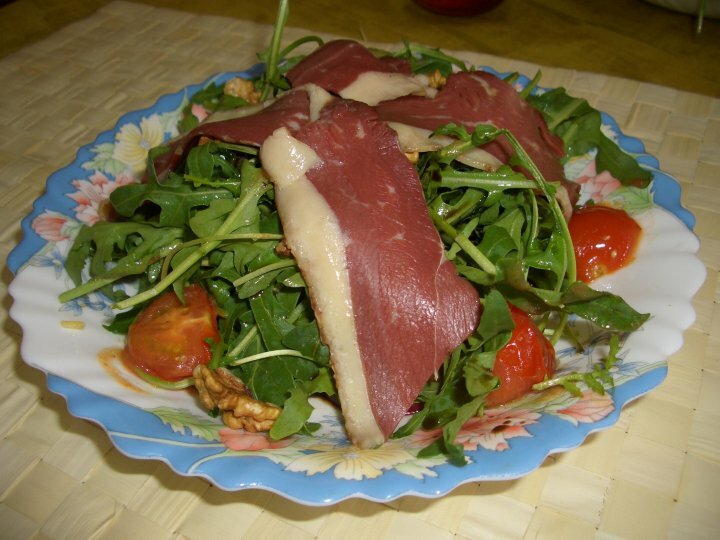 The next dish was a tasty salad with smoked duck breast, ruccola, cherry tomatoes roasted in olive oil, nuts and peaches. 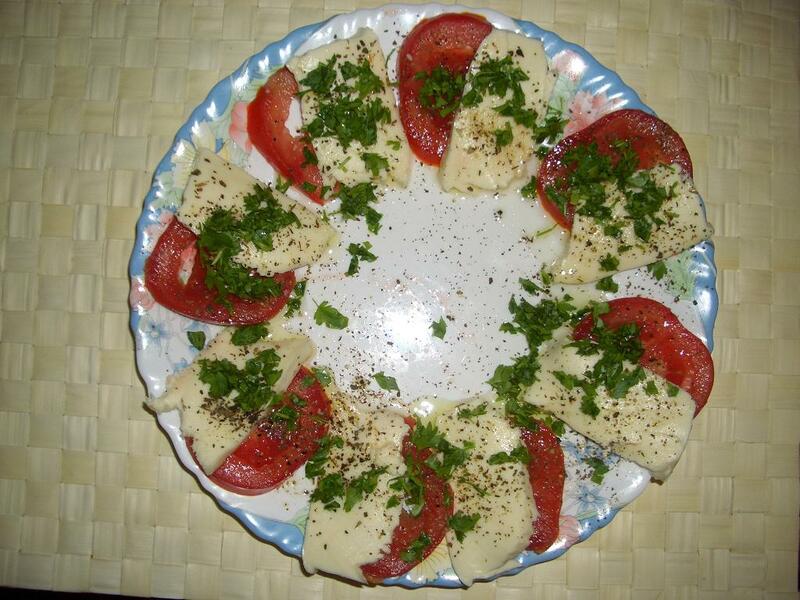 Continued to serve the Tokaj together with this dish and it paired nicely. 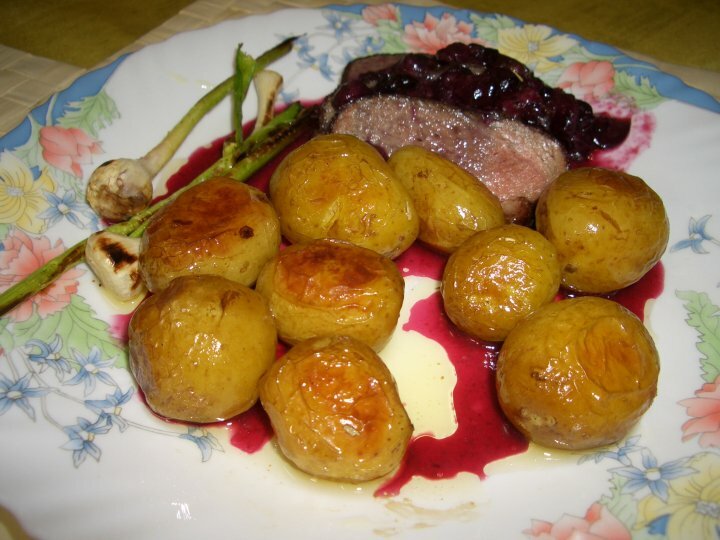 The next dish was a little more complex: medium-rare magret de canard, baked baby potatoes with rosemary, grilled baby garlic and blueberries gravy with 3 spices. 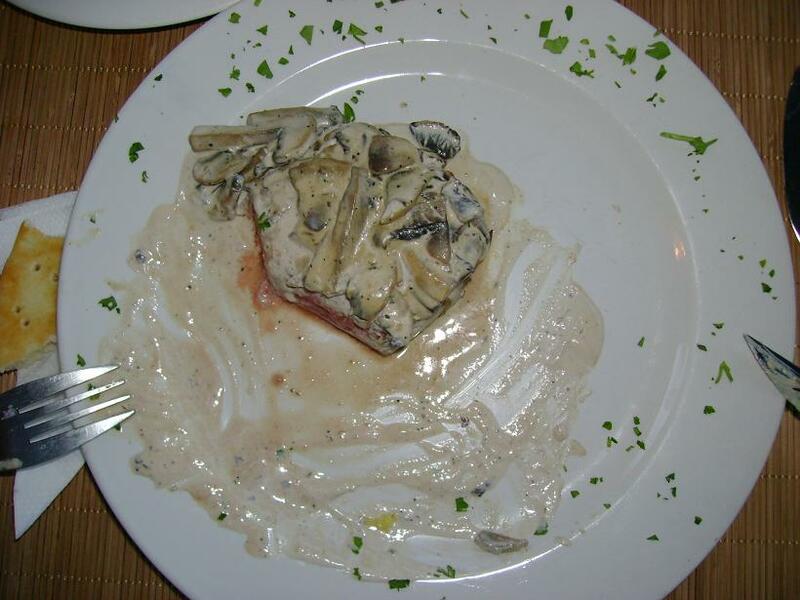 For this dish, choosing the wine was initially a challenge, as I wanted to try the Clos Marie cuvee Simon 2007. Fortunately after 3 h in the decanter the wine proved to be a perfect match. This wine is produced in Pic Saint Loup, an area in Coteaux du Languedoc AOC. One of my all time favorite producers comes from this region being considered the Cru Exceptionelle of the AOC – Chateau de Cazeneuve with its two top cuvee’s: Roc de Mates and Sang du Calvaire. 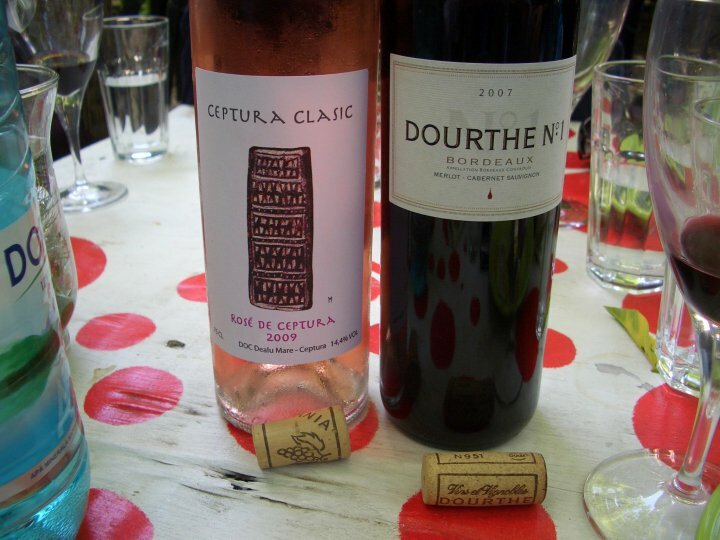 Both these two cuvee’s, selling for 21 and 35 EUR, could be found in Bucharest in a store on Calea Dorobantilor. Pic Saint Loup is the name of a mountain (658 m alt), 20 km north of Montpellier, which is central to the small adjacent wine region. 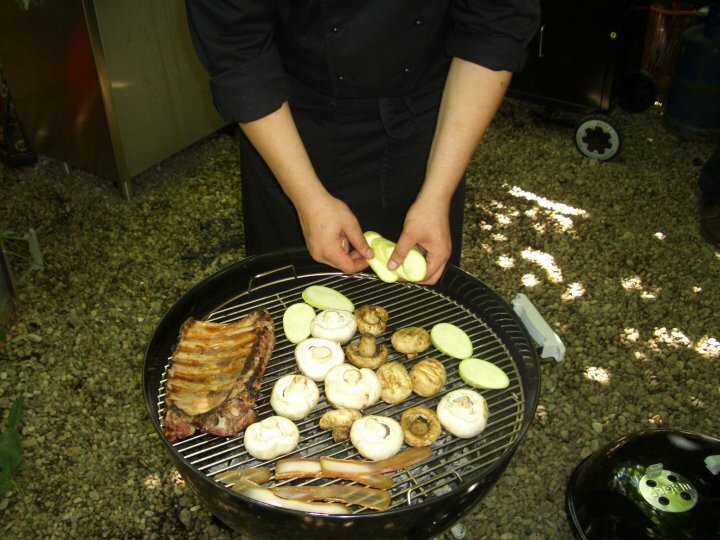 Chateau de Cazeneuve is a small producer and its wines are the favorites of quite a few Michelin stars chefs. Clos Marie was created in 1994 , beginning with 8 hectares, 75% of which were uprooted and replanted. It is today a 20 hectares vineyard, all bio dynamic. It is always nice to end a working week with a great and relaxing dinner with friends. Plus this week we celebrated my wife’s name anniversarry so more reasons to party. Therefore FRI evening we had a lovely dinner in good company with our friends: Calin and Annemarie and in the company of some impressive wines. Solaia, which means “the sunny one” in Italian, is a 10 ha southwest facing vineyard planted 351-396 m above sea level on stony calcareous soil of marl and friable albarese rock. It is located at Santa Cristina, cheek by jowl with the renowned Tignanello vineyard, in the Mercatale Val di Pesa zone of Chianti Classico. Antinori first produced a single-vineyard wine from this site in the 1978 vintage, but this was a limited release in Italy only. 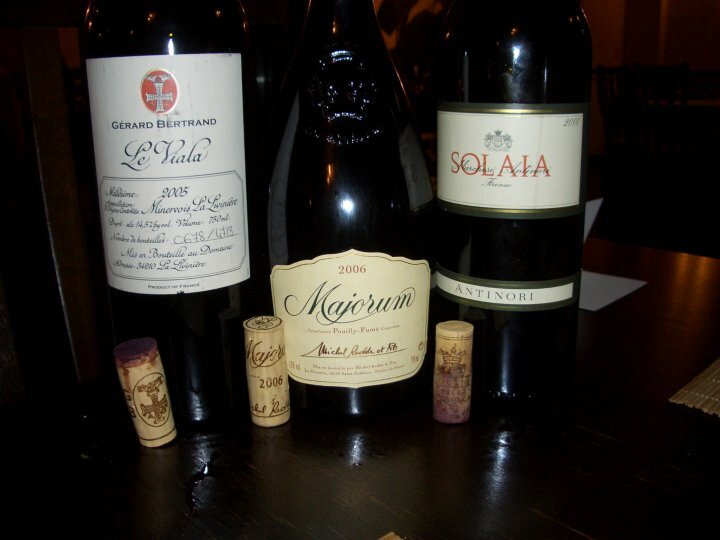 Because of the “non Chianti” grapes used (the Cabernets), Solaia was classified as a lowly Vino da Tavola di Toscana rather than DOCG Chianti Classico. Solaia is a blend of 80% Cabernet and 20% Sangiovese. 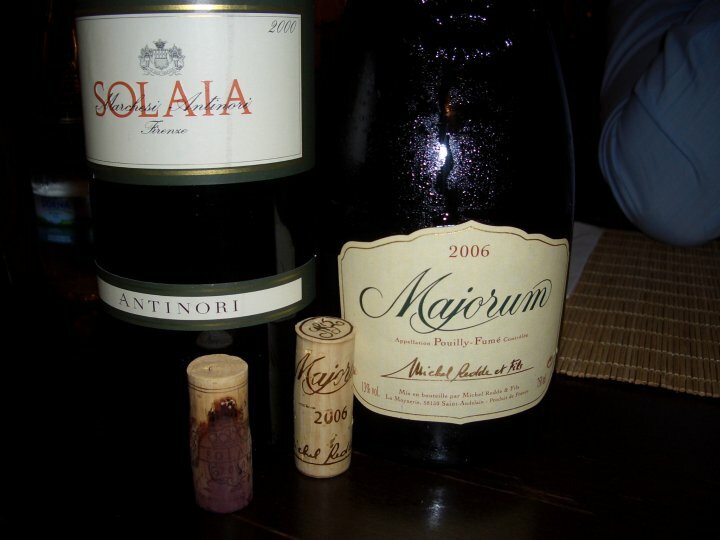 Initially, the 2000 Solaia was considered over priced for what it was. Now, 10 years later from the vintage, the wine evolved nicely. The wine is very Bordeaux style. The cork was almost entirely wet so I have some doubts about how well the rest of the bottles will be preserved, even though, no doubt, the wine can last more years. Pouilly-Fume, also known as Pouilly Blanc Fume and Blanc Fume de Pouilly, is one of the Loire’s most famous wines, perfumed dry whites that epitomize the Sauvignon Blanc grape. Sauvignon here is often called Blanc Fume, because wines made from this variety when grown on the predominantly limestone soils, with some flint (silex), supposedly exhibit a “smoky” flavour, or whiff gunflint (pierre a fusil). The wines are certainly perfumed, sometimes almost acrid, and it takes extensive local knowledge reliably to distinguish Sancerres and Pouilly-Fumes in a blind tasting of both. Pouilly-Fume is arguably a more homogeneous appellation than Sancerre. Unlike that of Sancerre , the Pouilly-Fume appellation applies only to white wines. The best Pouilly-Fume (such as the range produced by Didier Dageneau) is perhaps a denser, more ambitiously longlived liquid than Sancerre, for drinking at 2 or 6 years, rather than one or four(there are also exceptions). 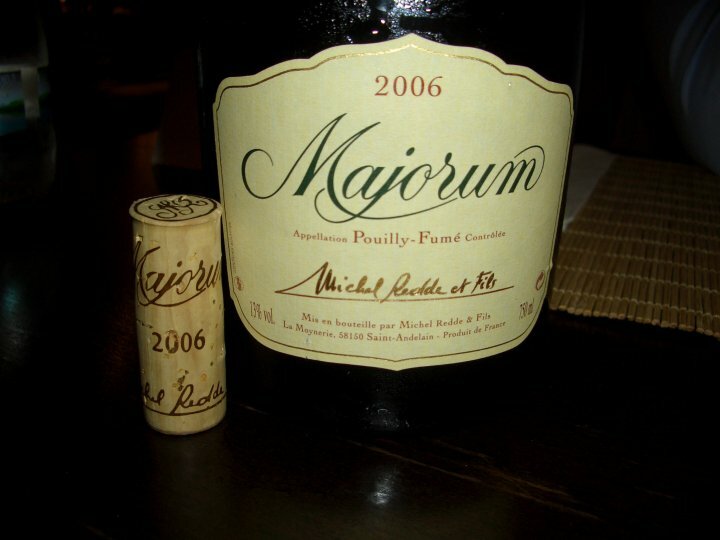 Some producers began experimenting with oak for both fermentation and maturation in the mid 1980s and the wines of the region have become more complex. Pouilly-Fume’s minimum alcoholic strength is 11 per cent. In the 1970s and 1980s, Puilly-Fume was much favoured by fashion, and the total area planted with Sauvignon increased considerably. In the mid 2000s, it totalled about 1000ha. Gerard Bertrand is an ex-rugby international. He has a sizeable operation, with some 250 hectares of vines spread across some fine Languedoc terroirs. In addition, Bertrand operates in partnership with 40 growers and 10 coops in the region. Expansion here has been quite recent, with the development of the brand at Château l’Hospitalet (in the La Clape region of the Languedoc) in 2002. La Clape property has 52 hectares of vines and is now the showpiece of the operation. Also, Bertrand has 110 hectares in the Corbières, 50 hectares in Minervois la Livinière, and 40 hectares at Cigalus (this wine is classified as Vin de Pays d’Oc). The range of wines produced is extensive and is stratified into six lines, designated both by AOC and also by grape variety. ‘Parcel’ sits at the top, then there are the ‘H’ range and ‘Properties’ range at the next level, then ‘Terroir’ and ‘Collection’ just below them, then ‘Classic’ at the bottom. Cornas is a wine appellation in the northern Rhone with the potential to provide serious challengers to Hermitage on the opposite bank to the north. Cornas was renowned in the era of Charlemagne, and in the 18th century, but many of the terraced vineyards on its steep south-facing granite slopes fell into decline in the early 20th century. The appellation experienced a revival of interest in the late 1980s with the arrival of ambitious newcomers prepared to reestablish the terraces needed for high quality vineyards, so that by the mid 2000 there were almost 100 ha of vineyards in the production. Starting with the early 1990s new techniques have been used: new oak and destemming, an anathema to Auguste Clape, the standard bearer during the lean years of the 1970s. 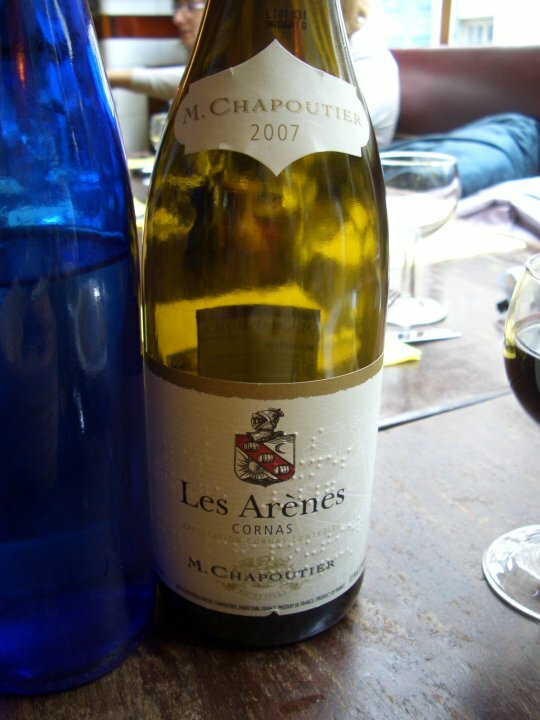 Perhaps because Clape’s very traditional wines demand considerable bottle age, Cornas gained a reputation as a long-living wine, but the likes of Thierry Allemandm, Eric et Joel Durand, Vincent Paris and Domaine du Tunnel are making a much more luscious style of Cornas. Many of the best slopes such as Les Renards in the south are well sheltered from the cold north winds and enjoy some of the best positions in the northern Rhone. Cornas can provide some of the most satisfying red wine drinking, and offers a much more uniform and dependable quality level than the elastic St Joseph appellation to the immediate north. I also tasted a Chapoutier Crozes Hermitage 2007 that was selling for 30 EUR that I found better than the Cornas. I liked the red fruit and dark chocolate aftertaste in the wine. My general experience with Chapoutier wines has not been very successful so far. I tasted: Chateauneuf du pape La Bernardine 2005 and 2006, Belleruche 2006, Coteaux du Tricastin 2006, plus a couple more and now Cornas and Crozes Hermitage. I didn’t find the wines appealing at all. Certainly not for the prices they sell for. Perhaps the premium cuvee’s are justifying their cost, but I’ll not venture to try them on my expense. 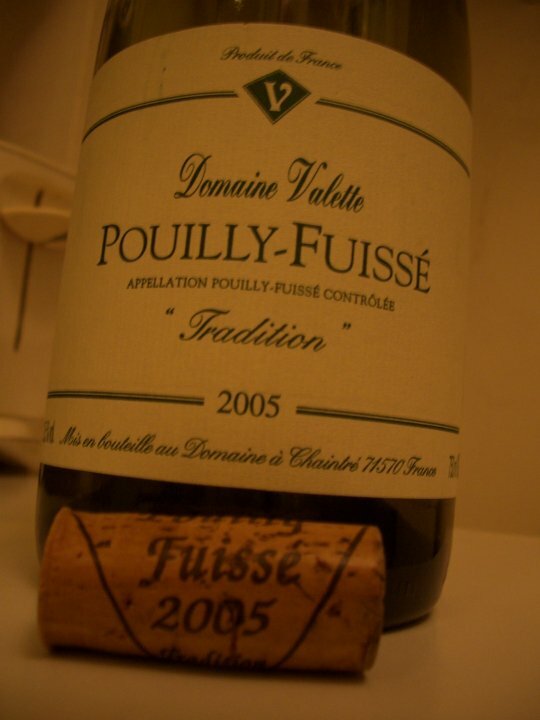 Pouilly Fuisse is an important white wine appellation which commands the highest prices in the Maconnais district of Burgundy. The appellation, restricted to the Chardonnay grape, includes about 850 ha in the communes of Fuisse(the most powerful wines), Solutre(the richest wines), Vergisson(most minerality) and Chaintre(the softest wines). There is no concept of Premier Cru vineyards in this appellation but Pouilly Fuisse may be followed by the name of a specific vineyard. A popular myth is that the soil beneath the crags was enriched by the remains of animals driven from the top of the cliff by Stone Age hunters. The wines are full body and ripe but do not usually attain the elegance of the finer wines from the Cote de Beaune. Normally bottled after a year’s barrel maturation, they are capable of aging well thereafter. Prices can vary a lot depending on the demands of major export markets in a given year. The largest and most fully planted of Sonoma county’s many vineyards valleys, Alexander Valley takes in the Russian river watershed upstream of Healdsburg north all the way to Sonoma-Mendocino county line north of Cloverdale. If the general history is long, with vines dating back into the 1850s, the particular history of noble varieties is – a few rare plantings excepted- as short here as almost everywhere else in California. Gallo’s acquisition of nearly 600 ha since 1988 in Alexander Valley alone signaled a new era for both Gallo and Alexander Valley. 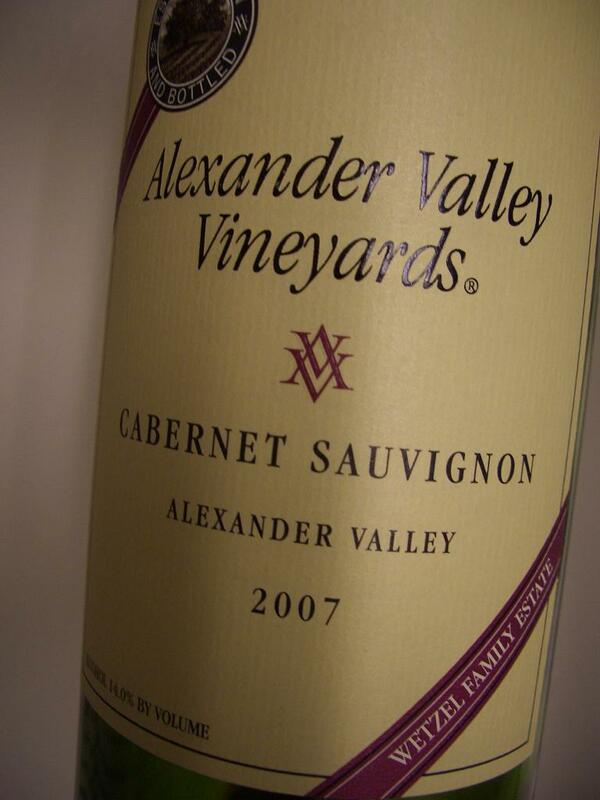 Alexander Valley is noteworthy among other Sonoma county appellations for the fleshy voluptuousness of its wines. A wide range of grape varieties is grown at least passably well, which has distracted from the question of what the district does best. Cabernet Sauvignon has gained a certain currency, with a signature note of chocolate warmth and agreeable mouth-feel. Chardonnays also tend to bold statement and ample girth. These varieties, market driven, dominate plantings. Most of its substantial plantings are on a broad and nearly flat valley floor very nearly bisected by the river, but some significant ones creep into the east hills. The 2007 vintage had early bud break and a fairly mild summer growing season with a burst of heat in AUG followed by a cool Sept. This seemed to set the stage for a textbook perfect harvest; then came rains in late Sept and Oct so results were mixed, especially for Cabernet Sauvignon on the North Coast. The advice is to hang on to the Cabernet. I have just received this bottle as a gift from a relative in the US so I decided to try it. I had this wine on a TUE evening together with a quick vegetarian meal. 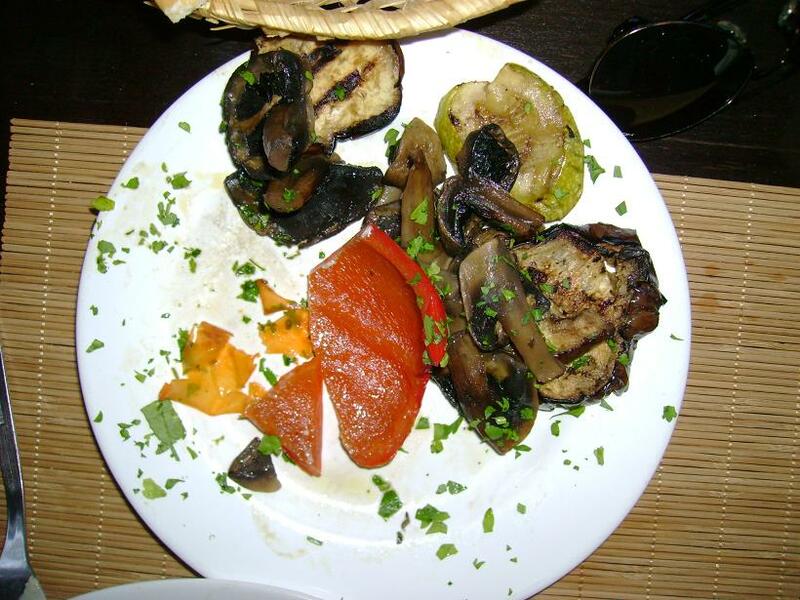 I try to eat vegetarian food a few days per week, as much of a burden as that might feel. 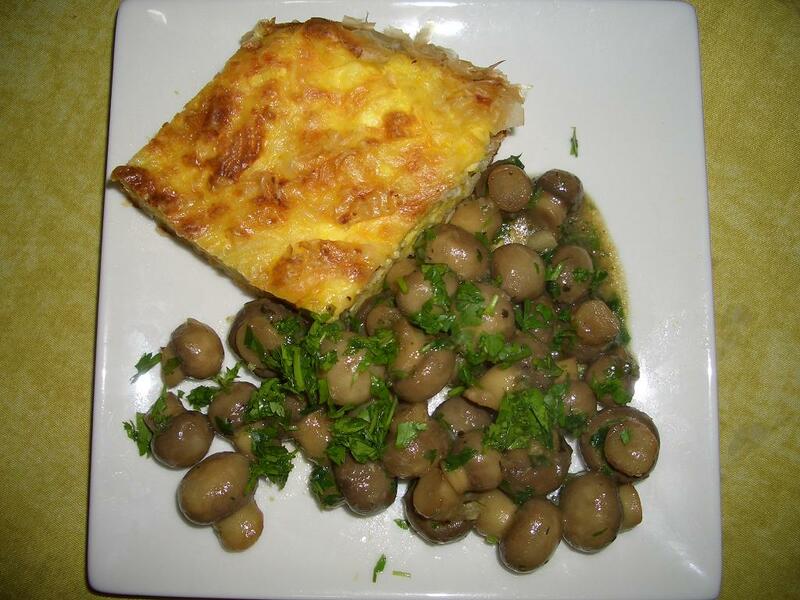 So a tasty cheese pie with mushrooms with garlic and a capresse salad seemed a good replacement. 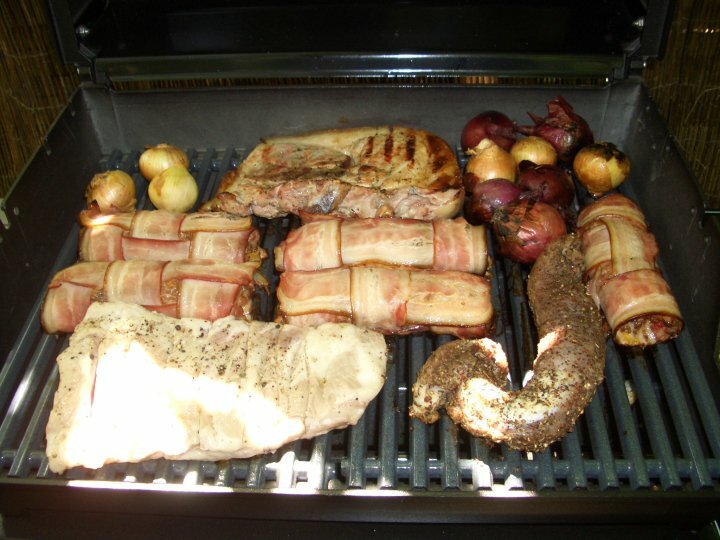 Perhaps not the best dishes to pair with a Cabernet but it was nevertheless a tasty dinner. The wine is a Bordeaux blend: predominantly Cabernet Sauvignon with small parts of Merlot, Cabernet Franc, Malbec and Petit Verdot. I was expecting a fruit bomb as usually this is the norm for Californian Cab’s, but I was pleasantly surprised how elegant this wine is. The wine has an opaque dark red/purple color. The nose is sweet with hints of dark red fruits, tobacco, blackcurrant, discreet green bell pepper, violets, spices. In the mouth the wine is juicy, a very nice silky mouth-feel, with good flesh, a medium to full body wine; blackcurrant, dark cherry, black pepper, earth are nicely balanced by the integrated oak. There is however a warmth feel on the back-end even though the wine has only 14% alcohol. 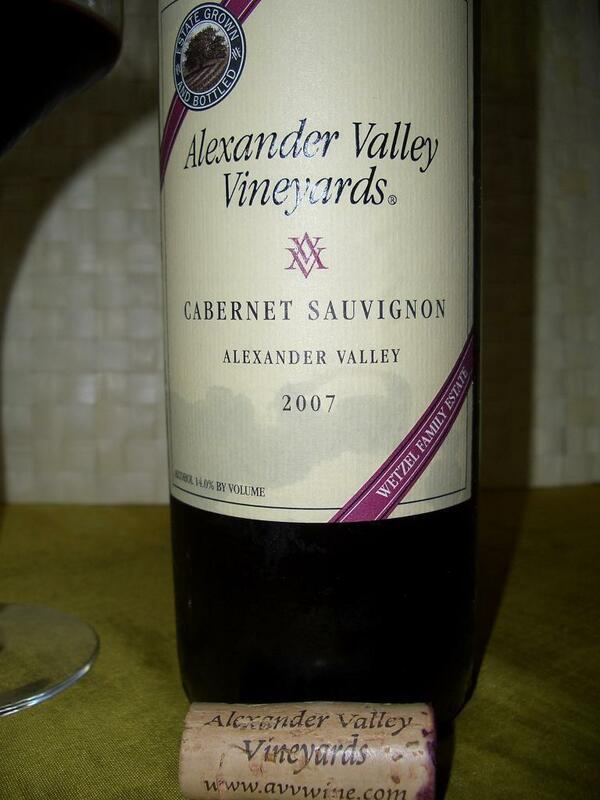 The wine has the typicality of the Alexander Valley having a long aftertaste with sweet tannins and bitter dark chocolate that remains in the mouth for a long time. Lovely, I liked this dry wine a lot. As far as I understood, the wine has a price level of $20-24. For this price the wine is amazingly good, nothing is over the top; with time, I am sure the alcohol will integrate completely and the heat will vanish. As for now the wine is Very good+. If you have the possibility to get this wine, you will definitely not be deceived by its quality. Please try it. Some of Spain’s most inspiring red wines are made in Priorat, an isolated DO zone in Cataluna inland from Tarragona. Its Spanish rather than native Catalan name is Priorato. In the 1990s, a true revolution engulfed the region, where production methods for Priorat had barely altered since the 12th century when the Carthusian monks first established the priority after which the wine is named. Priorat is one of the world’s few 1st class wines to be made from Garnacha (Grenache), together with some of the unfashionable Carinena(Carignan). The age of the vines and concomitantly extremely low yields, which average just 5 or 6 hl/ha, undoubtedly contribute to the intensity and strength of Priorat. Under the hot Mediterranean sun, grapes ripen to a potential alcohol of up to 18%, although in the 1990s this was steadfastly reduced. Poor, stony soils derived from the underlying Slate and Quartz, called locally llicorella, support only the most meagre of crops. Mechanization is almost impossible and many steeply terraced smallholdings had been abandoned in recent years as the rural population left to find work on the coast. The success of the new wave Priorat is slowly reviving the vineyards, however. Price level: 22-25 €. Alcohol – 14.5%. Purchased from Madrid, Spain. 80% Cabernet Sauvignon 20% Grenache, very atypical Priorat wine. The wine is opaque with a dark purple color and Port like appearance. The nose is sweet with nice minerality, pleasant greenness and spiciness, pencil, graphite, very discreet dark red fruit and nicely integrated oak. A very complex nose. In the mouth the wine is thick, very full body, with creamy texture, dark chocolate, coffee, dark cherries, tobacco, red currant, mineral notes, firm tannins on the back end. The wine has a beautiful long aftertaste with flavors coming back over and over again. Very impressive wine. Due to its low price level I consider this wine Excellent. This wine can easily compete against 40-50 € wines. I had this wine together with home made whole duck roasted in honey crust and then boiled in orange juice in a cooking bag in the oven. 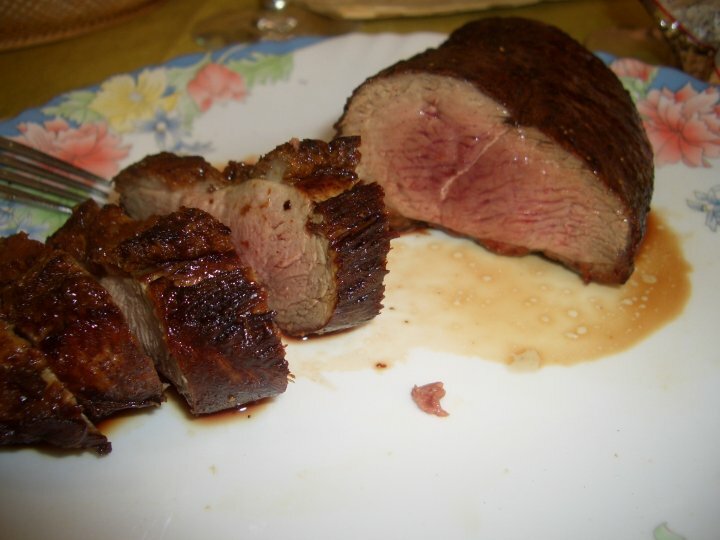 Made it crispy on the outside and juicy inside, preserving all those meat juices. 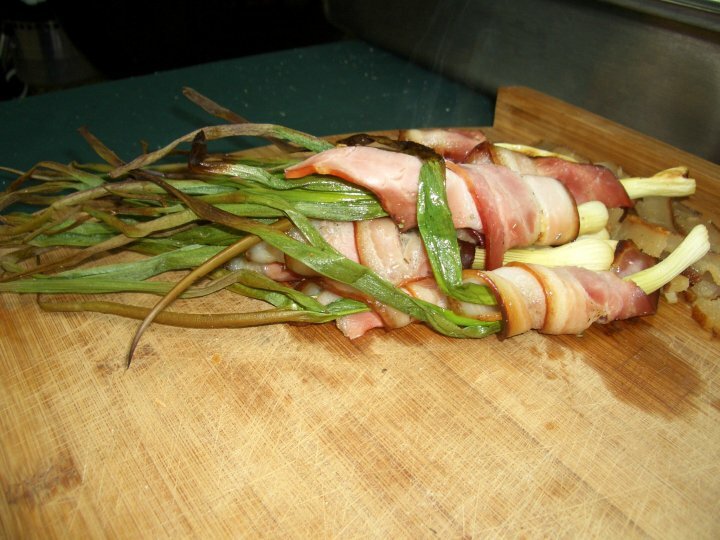 I used the duck fat to roast celery, potatoes, pineapple, garlic and carrots in a tray in the oven as well. 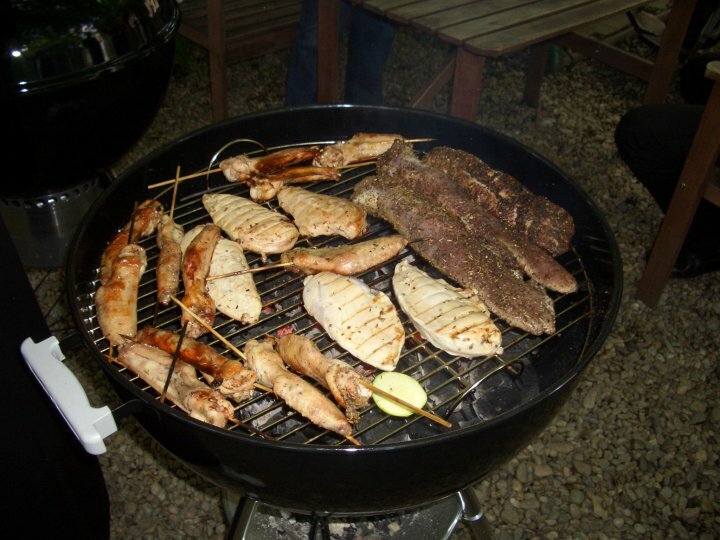 The result is pictured below. I firmly believe that drinking an impressive wine is a celebration in itself. Combined with a special occasion, like the anniversary of a dear friend, we have the x-ray of a perfect event. Last evening I had a lovely dinner with my good friend Dan, celebrating his birthday at a restaurant in Piata Operei – Trattoria Roma. 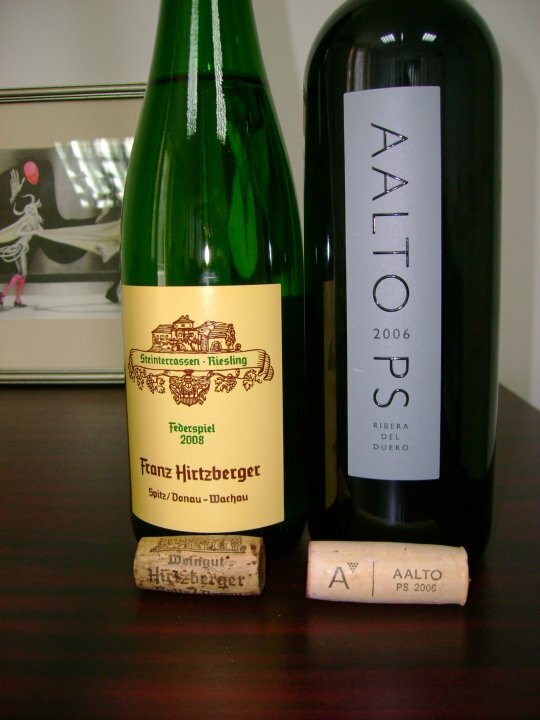 Dan is a wine lover as well, so the meal was accompanied by two amazing wines: Aalto PS 2006 and Franz Hirtzberger Federspiel Riesling 2008. We had a very tasty three course meal together with the two wines we brought in. 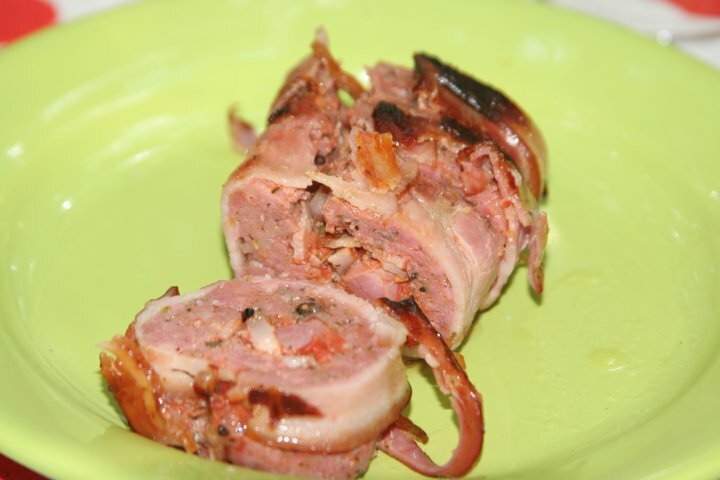 I am an advocate of pairing wine with food and I also try to have at least two wines with my meal when time allows. Please do not get me wrong, I am not saying you should drink 2 entire bottles. Alcohol consumption should be treated responsibly, but having 2 glasses of wine, each from each bottle, is more than enough to have a memorable dinner. Franz Hirtzberger, top Wachau producer with 20ha, is one of the seminal figures in a new generation of Austrian winemakers. 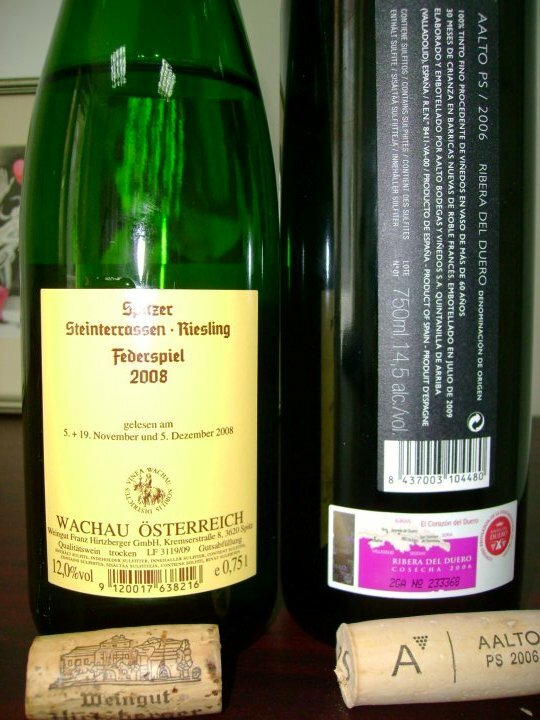 His winery, located above the village of Spitz, lies on the Danube at the western end of Wachau. 2008 was a nerve racking vintage that could produce outstanding results in the hands of the most careful producers. Protracted cool and rainy spells in Oct and Nov made harvesting very difficult in Lower Austria and in the Burgenland, but in the southern regions, the autumn was more clement. I have mentioned in a previous review of another Riesling the wines classification in Austria and you can read them here. Federspiel (named after a falconry device) is allowed 11.5% to 12.5% alcohol, roughly equivalent to Kabinett. 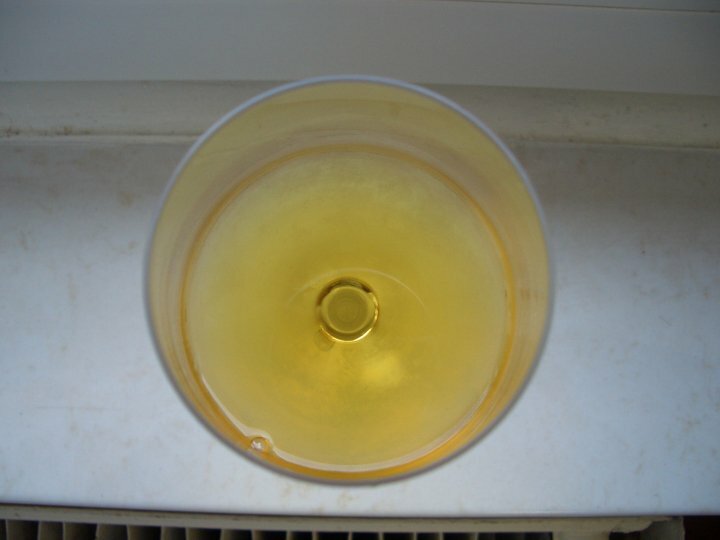 The wine has a clear gold color and an oily appearance in the glass. 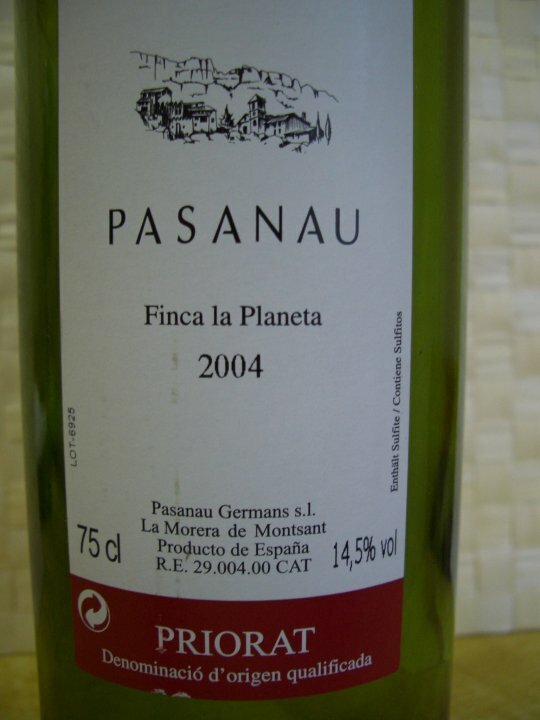 The nose shows flavors of honey, minerals, already discreet petrol aromas, white flowers and pears. In the mouth the wine is medium to full body with pears, green apples, nice minerality, everything wrapped into a beautiful very high acidity. Loved it. 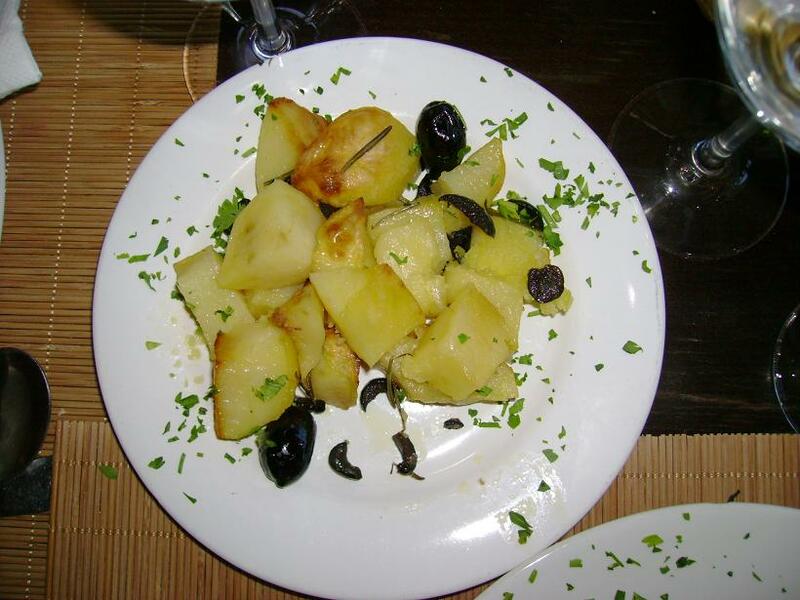 The wine finishes with a medium mineral aftertaste. That high minerality makes this a very good wine. 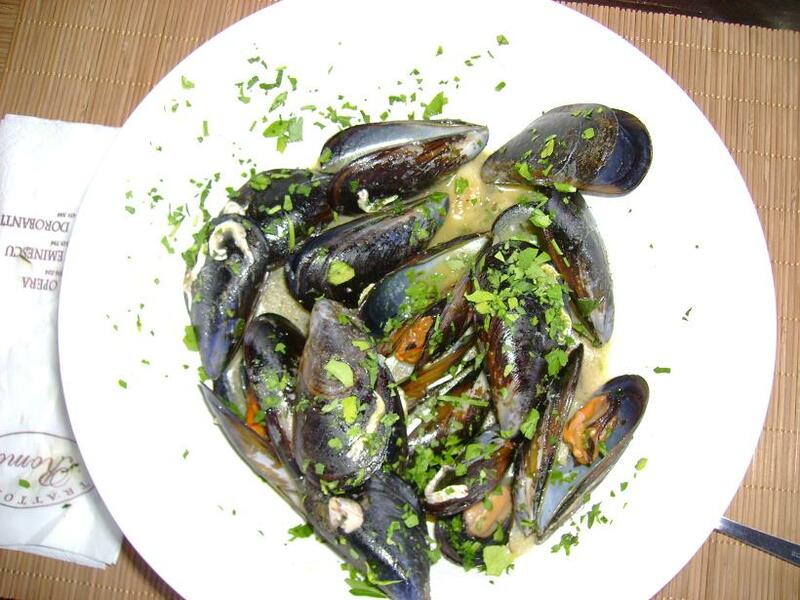 We had this wine with mussels in a white wine sauce. Not ideally as the wine was heavier than the food but a very nice pairing. Bodega Aalto was founded in 1999 by Javier Zaccagnini, formerly director of the Consejo Regulador de Ribera del Duero for 6 years, and Mariano Garcia, who was head winemaker at Vega Sicilia from 1968 to 1998. Aalto wines are the product of 100 ha of vines, comprising more than 250 parcels spread out over the various terroir’s of DO Ribera del Duero. No parcel is more than 3 ha, and no vine is less than 40 years old. The standard cuvee is named simply Aalto, with the bodega’s top wine called Aalto PS- Pagos Seleccionados (selected parcels). 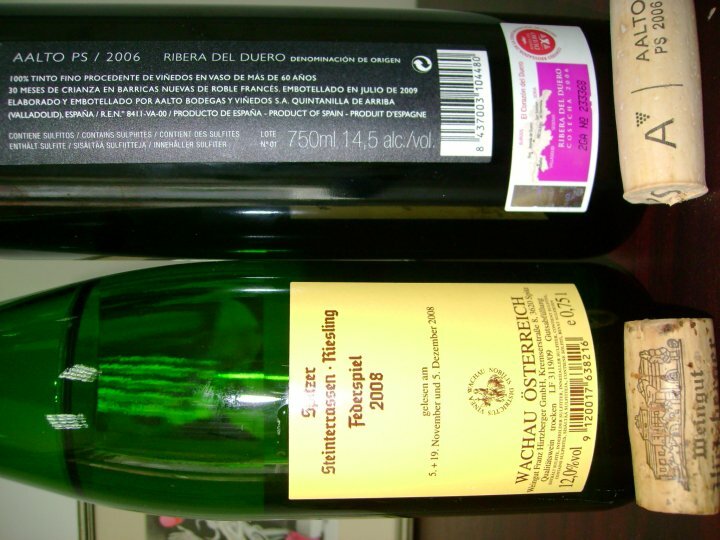 Tinto fino(Tempranillo) is the only grape used for the wines. Until 2005, wines were made at a rented winery facility in Roa, but Aalto is now based in a winery at Quintanilla de Arriba. The basic wine undergoes malolactic fermentation in steel vats, but for Aalto PS barrels are used. Aalto PS 2006 spent 30 months in new French oak and is made from vineyards planted in the 1920s or earlier. The wine has an opaque dark/purple color. I just love the smell of a Spanish beast locked in a bottle. The smell of the wine simply fills up the entire room with its aromas. The wine is thick, leaving many lazy legs coming down after swirling the glass. It has a very sweet lactic nose with pretty much all the specter of the wine aromas: ripe dark fruits, blackberry, blackcurrant, blueberry, ripe dark cherries, floral flavors: violets, spices, thyme, rosemary, cigar box, earth, mushrooms. It is the most complex nose I smelled so far. In the mouth the wine is full body, almost Port like, it creates a creamy mouth-feel. The wine is impressive, showing real finesse with over ripe, but not jammy, dark berries: blackcurrant, blackberry, tobacco, violets, chocolate, cocoa, mocha, even meaty everything wrapped in a sweet vanilla flavor from the oak. The wine shows immense balance and depth with layers and layers of flavors. When you have this nose and the mouth-feel you would expect the wine to finish with a sweet sensation. But that’s where this wine gains in complexity and surprises: the wine finishes in a very, very long aftertaste with a beautiful pure dark chocolate bitterness that stays with you forever. 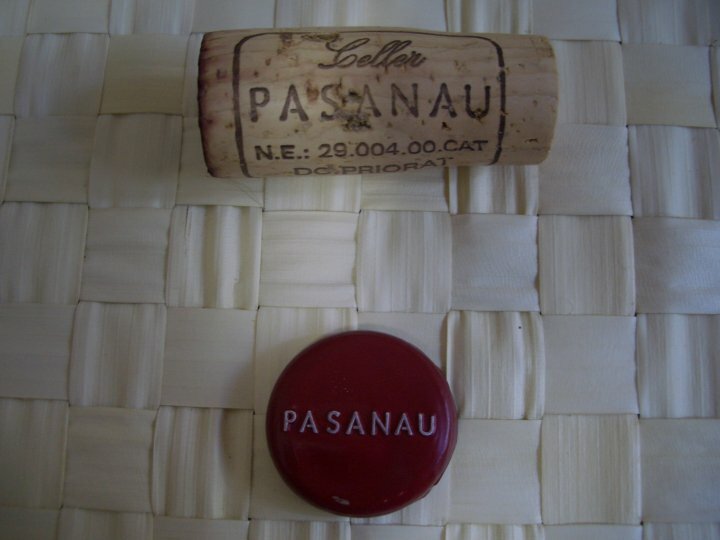 This wine has a price level of 65-70 EUR in Spain, so next time you visit Spain make sure to break the piggy bank and buy one of this bottles. You can serve this wine with any big food. We drank this wine with our next two courses: penne with beef, sour cream and tomato sauce and the last course: rare grilled beef with mushrooms and grilled vegetables. Perfect match. I wish my good friend Dan Happy Birthday and best of luck and thank him for sharing this amazing Spanish red. 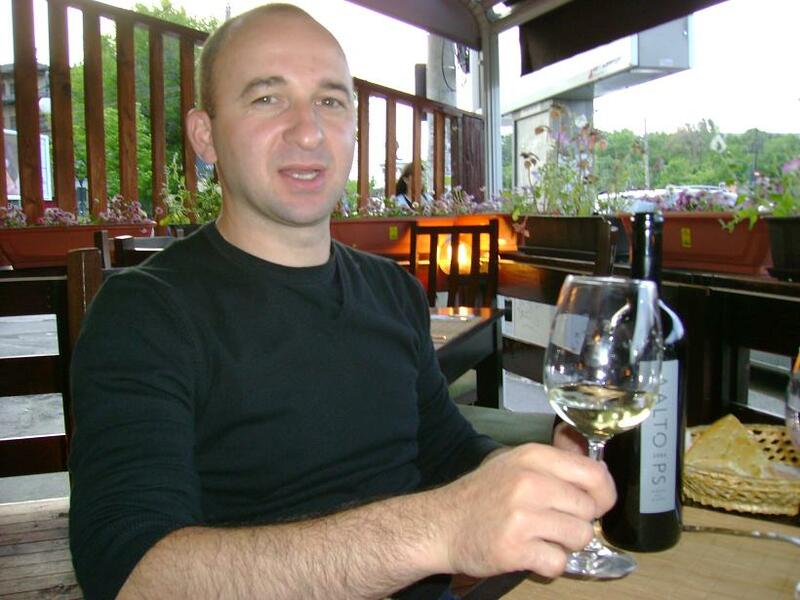 Even 4 h later, the wine was still fresh on my memory and I could really feel that amazing smell while watching the markets in the US falling sharply. Strange how the memory works when you are on the right side of the trade.